Speed like nothing you have experienced. A power package that will leave ANY supercar in its dust. 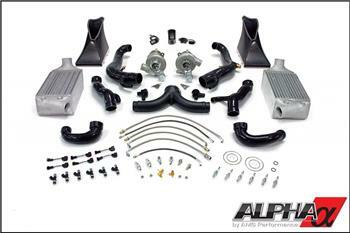 At over 900HP the Alpha 9 Performance Package will turn your Porsche 997.1 into a force to be reckoned with! At Alpha Performance we are driven to deliver enthusiasts like you the best performing packages without compromise. For those unfamiliar with our work, the Alpha 9 Porsche 997 Performance Package wasn’t just an idea we sketched out and test-fitted onto a vehicle using the conventional “trial and error method” so common in the aftermarket performance industry. As an engineering company first and foremost, development of this performance package started with a thorough review of the 997’s powertrain. Using advanced engineering methods including the aid of SolidWorks CAD software and a CMM ROMER arm, our engineers properly designed the necessary upgrades to safely produce over 900 horsepower and 680ft-lbs of torque on racing fuel. Requirements of this package involved the provision of a turbocharger system capable of producing a substantial increase in horsepower with no loss in boost response when compared to the 997’s stock VTG turbocharger system. By replacing the stock system with our larger, billet wheel, ball bearing turbochargers, we were able to retain the quick spool-up characteristics of the stock system while significantly improving performance across the entire powerband. In addition, our upgraded turbochargers remain in the stock locations – avoiding clutter and fitment issues. The Alpha 997 Intercooler System utilizes a pair of 5.5” thick, high volume cores giving you the most power producing option on the market. Each core provides twice the fin density (24 fins per inch) for unmatched cooling. The Alpha 997 Intercooler System retains full use of the intercooler inlets (located in front of each rear wheel) forcing cool air into our larger, carbon fiber shrouds. Not only is this option more aesthetically pleasing, each rigid, OEM-quality, carbon fiber piece is made to seamlessly mate to the Alpha Intercoolers feeding them cooler ambient air more efficiently. Not to mention eliminating the need to remove or butcher your intercooler ducting like the competition. Another key component to the intercooler system is our computer designed intercooler piping. This features a cast aluminum y-pipe offering 40% more flow. The larger 2.5” diameter is significantly wider than stock (1.79”) and its cast aluminum construction allowed our Engineers to provide the best flow while conforming to the tight surroundings of the engine bay. In addition, our computer designed, precisely molded, custom silicone couplers provide perfect fitment and optimized geometry for improved airflow volume and velocity. All of this careful planning and design equates to unmatched power and response helping you stay ahead of your competition! From our tests, mating the factory air box to higher volume intake tubes are proven more efficient for extreme horsepower applications. Not only does this allow for more horsepower, it is essential to producing it safely – ensuring optimal intake air temperatures (IAT). Where the stock intake tubes collapse under the intense vacuum loads created by our billet wheel turbochargers, our high volume silicone intake tubes are steel wire reinforced to withstand such increased levels of negative air pressure. In addition, our CAD design allows us to maximize the dimensions of this reinforced tubing, providing you the highest capacity for air flow while fitting within the tight confines of your 997’s engine bay. Boost response is then further improved with our proprietary Alpha VCS calibration file to properly adjust boost, cam timing and fueling. The greatest benefit of the Alpha 9 Porsche 997 Package is the increased power and torque figures in all areas of the power band. This isn’t a 900hp top-end only car, there is more torque and horsepower available at all RPM points. No waiting for the power to come on or the turbos to spool, when you lay into the throttle you are met with an immediate rush of torque. What makes this performance package even more appealing is that it offers exact tolerances and fitment within the tight confines of the 997 engine bay. Unlike most competitor’s upgrades, the Alpha 9 Porsche 997 Performance Package was developed to provide a comprehensive, yet minimally invasive solution to maximizing the performance of your Porsche 997.1 Turbo. No need to cut up or hack into your prized possession! We took the extra time to engineer this package for precise, OEM-like fitment so your car doesn’t turn into a custom fabrication project. Not only does this package improve the size and effectiveness of the turbo and intercooler systems, This is all done without deviation from the efficient stock routing. Such a design cannot be replicated by hand or measured by the naked eye. It requires CAD development, metal casting and an engineering skillset uncommon in the industry. The Alpha 9 Porsche 997 Performance Package offers you a complete system with nothing left to buy. We provide all the necessary upgrades to your fuel system as well as all the lines and hardware needed for a painless installation. For customers who wish to upgrade their exhaust system, we offer AWE’s GT2 inspired lightweight 997TT exhaust system. This bolt-on exhaust system was chosen for: its ability to support a high level of power, incredible sound characteristics as well as superior build quality. It features 14 & 16 gauge 304 stainless steel construction, free-flowing HJS 200 cats and muffler. The system is routed using single piece CNC mandrel-bent tubing with all seams precisely TIG welded by hand. Only the highest quality materials and components go into our Alpha Performance Packages and this AWE 997TT Lightweight Exhaust is certainly no exception. The Alpha 9 Porsche 997 Performance Package is available with the optional Sachs 2.5 Racing Clutch and Lightweight Flywheel. Note: an upgraded clutch is a requirement for the Alpha 9 system, the stock clutch is not able to hold the torque.